As the barbarians rise and the Huns are loosed upon the world, the Western Roman Empire staggers, pierced by a thousand blades. These are the end-times; the age of blood and fire! Experience the horrors of the apocalypse with Blood & Burning for Total War: ATTILA. This pack adds blood-spurt effects, decapitations, limb-lops, disembowelment and more to the game. Disease-ridden soldiers can even be seen vomiting on the battlefield, adding to the ghastly realism. •	Gory new Campaign Map combat anims with blood-spatter, arm severance and decapitations. •	Ultraviolent Battlefield combat animations including limb-severance, decapitation and blood spurts. •	Soldiers in armies suffering from disease will vomit when idle on the battlefield. •	New burning and burn-to-death animations for both soldiers and civilians. •	New gore decals in battles depicting vomit, blood and bodily organs. •	New, blood-soaked versions of key animated event messages. 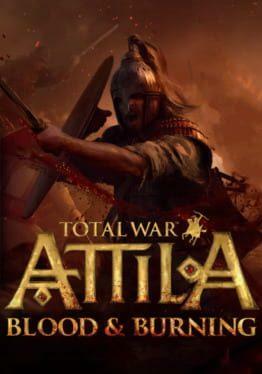 Total War: Attila - Blood & Burning is available from 1.89 to 2.24 from 3 shops.